Downtown Eastside of Vancouver. Photo courtesy of Viv Lynch/CC BY-NC-ND 2.0. Journalists need more than good intentions when venturing into Vancouver's Downtown Eastside to tell its stories. 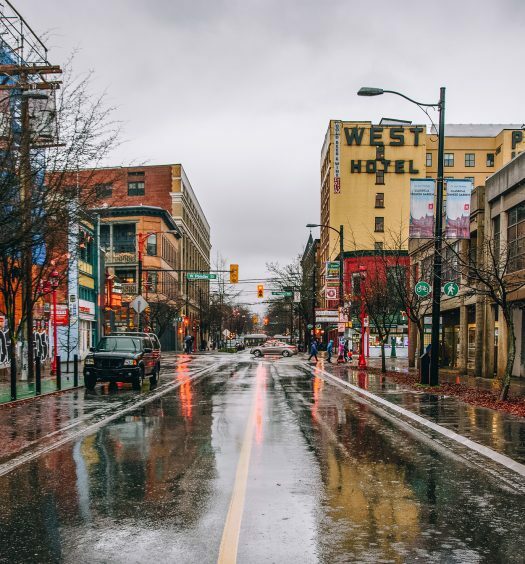 We had believed that going to the Downtown Eastside with good intentions would enable us to report with sensitivity and respect for the community. But we were wrong to think it’d be that simple. In January, our reporting group — six UBC journalism students, including the authors of this article — elected to write an article for the school’s news website about the Downtown Eastside city-sanctioned market. We focused on the market’s role as a reliable space for the community to gather, rather than its function as a place for vending. From the beginning, it was always our intention to avoid well-worn stereotypes and negative frameworks of the Downtown Eastside. 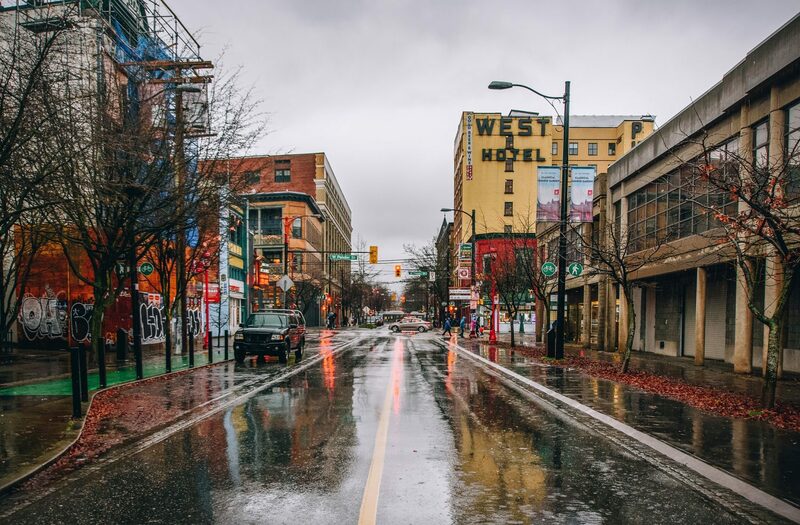 During the entire reporting and writing process, we assumed we were different — we would not portray the Downtown Eastside as “gritty” or its residents as one-dimensional, living in abject poverty, addiction and despair. We did not see ourselves as venturing into “Hell,” the name ascribed to the neighbourhood by one local newspaper. We told ourselves we would avoid those traps. Only later did we learn about the influx of student journalists reporting in the community. We had naively considered only our story and ourselves when we went there. Blyth left us to consider our intentions. We wondered why journalism students keep repeating the same mistake over and over, and how we can do better. As students, should we have been kept from going down there, considering how many young journalists flock to the Downtown Eastside? We also started to ask ourselves how we should interview people who do not share our privileges. In our ethics class, we had discussed how media underserves and misrepresents people, particularly in stories around race and gender. But those conversations rarely touched on class. How should journalists report on people who are marginalized? How can we instil trust, negotiate consent, and write with language that doesn’t subject people into “others”? We talked with journalists, teachers and community members to find out how to report in a way that is respectful and reflective of the voices found throughout the city. Early on, we had learned that journalism is about doing the best job possible before deadline. Because of the time constraints journalists come up against, it’s necessary for us to build relationships with people and organizations and to invest in them long-term. Travis Lupick, journalist and staff writer for the Georgia Straight, echoed this sentiment when we interviewed him over the phone. “If you want to do something great, you’ve got to put in time. There’s really no substitute for that,” he said. Committing time to relationships is especially important when interviewing people who are vulnerable and when understanding context is paramount to understanding the larger story. Without context, people’s lived experiences can be misrepresented, said Jessica Hannon, executive director of Megaphone magazine. Stanley Q. Woodvine is a blogger living in Fairview who said he’s experienced this oversimplification firsthand. Woodvine said after being without a house for some time, he gave up on affordable housing because he found the idea of putting the bulk of his funds towards a room unfeasible. Since he doesn’t have a permanent address, he said people often make negative assumptions about him, such as him being an addict. “Groups that are on the margin tend to get homogenized in the imagination,” Woodvine said. For that reason, he avoids speaking to big media outlets. “Anytime I would go in there I would have to start by answering the same questions: are you a drug addict? How much money do you get from the government?” he said. Without dedicating time to people and their stories, journalists risk exposing their subjects to harm. Sarah Common, co-founder of the beekeeping non-profit Hives for Humanity which works in the community, said it’s exhausting when journalists and researchers come to the Downtown Eastside to fill in articles with quotes without taking the time to really listen to residents. Journalists are taught to uphold objectivity in their reporting. But Hannon said journalists and others use language that is often not as neutral as it may seem. Nicolas Leech-Crier, who describes himself as a proud father and proud member of the family known as the Downtown Eastside, also said that language is an issue in journalism and public conversation in general. A contributor to Megaphone and Visions Journal, Leech-Crier works with Spikes on Bikes, an initiative to collect used needles from the streets, distribute clean ones, and administer Narcan when needed. He started working for Spikes on Bikes around Christmas 2016, at the height of what he calls the “human crisis.” As soon as he realized the severity of the crisis — the overwhelming number of lives being lost to opioid overdoses — he was trained with Narcan. Leech-Crier eschewed the label commonly given to people without permanent home addresses. “I spent 20 years on the streets. I’ve never called myself homeless,” he said. When we asked what a better word would be, he hesitated. Woodvine agreed “homeless” is a limiting term. 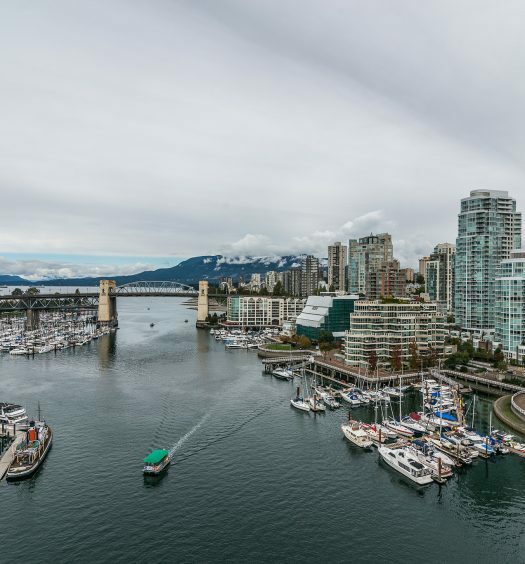 Occasionally, he’ll write about living on the street in his blog sqwabb: a view from the street with no particular focus, but he mostly sticks to other topics like his neighbourhood, technology and municipal policy. Woodvine said he’s not the only street-embedded blogger publishing online, but he gets a lot of readership from being included in the Georgia Straightunder the column “Homeless in Vancouver,” a title he did not choose and says is not an accurate representation of the blog. “Not even 40 per cent of my blog is about being homeless. Most of my blog is about things that interest me. Meanwhile, readers of the Straight are going, what does this have to do with homelessness? They think, because [‘Homeless in Vancouver’] is in front of every single thing, that every single thing is about homelessness. There’s an inherent power dynamic in journalism between the reporter and the subject. In nearly every situation, the journalist has the upper hand. They’re the one who decides what information to include, what quote to use and how to contextualize it. “Given a more equal share of power between the interviewer and the interviewee, given a relationship that is based on mutual trust and respect and informed consent, I think that the process of telling one story can actually be really empowering,” Hannon said. “But it often isn’t because there is such a power differential. Because there’s such a knowledge differential, it often is really exploitative,” she added. Hannon said that ensuring consent is informed and continuous throughout an interview will help prevent the person who is sharing their story from experiencing undue harm, at publication and down the road. It is more important than ever to explain to interview subjects the ramifications about participating in media, since nearly all news stories, TV news segments, and radio programs appear online. By giving the tools necessary for informed consent, reporters can end up protecting not just their subject, but every person connected to them. Leech-Crier said he was in the news a lot when Spikes on Bikes first started, but he wasn’t a fan of all the coverage. One TV broadcast he was featured in included many shots of users injecting and overdosing on the street. He said the piece was “sensationalized” and didn’t include the most important aspects of his conversation with the reporter. “It was just a fluffy news story, and I decided to just write my own thing for Megaphone,” he said. He said he believes reporters are able to write about the Downtown Eastside well — with sensitivity and understanding — but that he can also write his own articles if he doesn’t like someone else’s coverage. Many of the people we interviewed are involved in community initiatives to address the issues of power dynamics involving residents and outsiders who want to chronicle or study them. Sarah Common and the team at Hives for Humanity have developed an intake form for anyone looking to create art, journalism, or research — what she calls cultural production — about the organization. The form asks questions to help both the producers and the community make clear expectations of consent, collaboration and how the project will be shared. Similarly, Leech-Crier is helping to develop a “Manifesto for Ethical Research in the Downtown Eastside.” The manifesto, which is still in the works, was developed from six weekly workshops where members of the community discussed what guidelines should be necessary for research projects in the Downtown Eastside. The manifesto was drafted from these talks by Simon Fraser University PhD student Scott Neufeld. “That’s a major change around here,” he said. In addition to the manifesto, SFU runs a program in partnership with Megaphone magazine twice a year that teaches basic journalistic skills to people experiencing poverty. As a writer for the magazine, Leech-Crier encouraged other aspiring writers to develop their own voice in the community. We called Sarah Blyth after having the conversations we should have had months ago. She was busy, in the midst of her campaign for city council as an independent candidate. We wondered whether she would remember speaking to us in February. And probably, on some level, we were eager to prove ourselves — to prove that we cared and had taken the time to understand how we’d gone wrong. She said she thinks it’s important to educate students when she sees them coming into the neighbourhood. “You don’t want to be just another legion of marching students taking photos and asking people for questions,” she said. She pointed out that the street is the only place for some people to live, and when reporters intrude on this space, those people have nowhere to escape. She conceded that the media is tasked with a difficult job covering the opioid crisis. “You’re trying to get people to understand the depth of the crisis that we’re in. More people than ever are dying, and you want people to understand that — all the time respecting the persons and not harming them anymore than they’re already harmed,” Blyth said. What Blyth and everyone else we spoke with are asking for are basic courtesies: to take the time to understand the people we’re interviewing, to ask for their consent and to use language that doesn’t reduce them to stereotypes. These are not big things to ask for, but they are all things that journalists have struggled with. And for us, students learning basic tenets of reducing harm in media, they are principles that must be taught in school before venturing out into the field. This story was originally posted on the The Tyee and is republished here with the permission of the authors. Jess Mackie is a student at the Graduate School of Journalism at UBC. She is a Wisconsin native who reports on agriculture, the environment and natural resources. Steph Eva Wood is a student at the Graduate School of Journalism at UBC, a member of the Squamish Nation and born and raised in North Vancouver. She writes about Indigenous stories, social justice and the environment. They wrote this piece for the Tyee as part of a summer internship. What do we mean when we say ‘Solutions Media’?